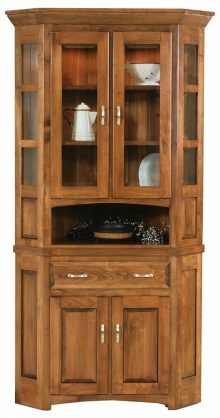 Choosing Amish furniture for your home is a natural choice. 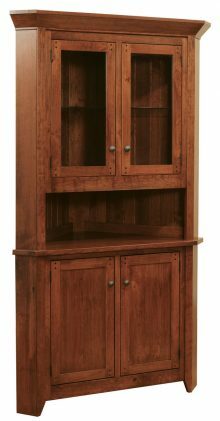 Traditional Amish furniture has long been known for its attractive design and long-lasting durability. You can find solid wood Amish furnishings in homes all across America. But one misconception is that Amish furniture is always extremely large and takes up a lot of space. You might be pleasantly surprised to learn that here at AmishOutletStore.com, we have many more compact furniture options for even the smallest homes. Take our Amish-made corner hutches, for example. 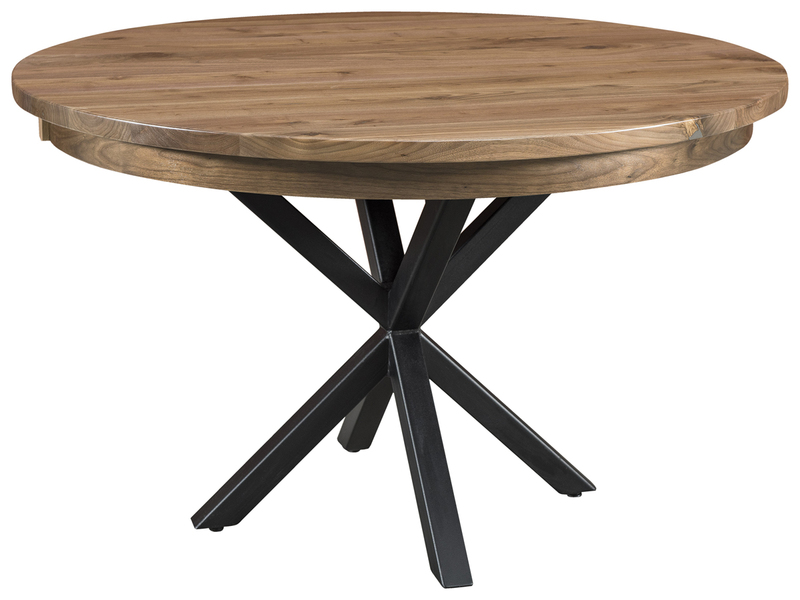 Designed to fit snugly in the corner of your dining room, they don’t require a lot of floor space. In many dining rooms, the corners are wasted space anyway. Choosing one of our compact Amish corner hutches gives you lots of storage space with little impact on the space in your room. 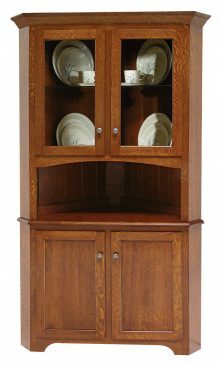 And for more spacious dining rooms, we also carry many larger corner hutch options that give you a maximum of storage space for your dishes, tableware and other possessions. Instead of solid hardwood, this furniture is typically made from low-quality laminates, particleboard and pressboard. This type of material isn’t suitable for furniture, as it can absorb moisture and warp and deform over time. Many of these pieces are designed for disassembly for shipping. Not only do you have to build your furniture yourself, but the attachment hardware is usually plastic and cheap metal and can break or pull out of the particleboard. The finish on assembly-line furniture is usually glossy and unnatural, with fake wood grain patterns applied as veneers. These veneers don’t resist wear well, and can even start to flake and peel after a short amount of time. 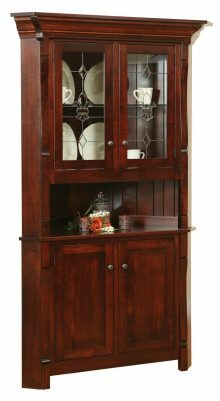 Contrast that with solid wood Amish furniture like our corner hutches for dining rooms. The wood for each piece is northern kiln-dried lumber chosen for its grain and beauty. 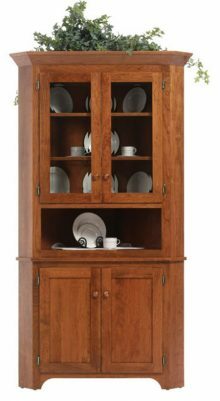 Amish artisans will apply their generations of knowledge and skill to crafting the individual pieces of your hutch and assembling them together. They will finish off with a beautiful, rich stain of your choosing and add attractive glass doors, hinges and handles. 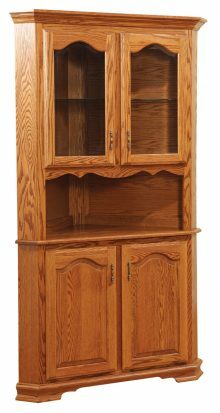 With this kind of quality workmanship, you know that your solid wood Amish corner hutch for your dining room is going to last. Your children will be able to enjoy it when they have a house of their own, as will your grandchildren. 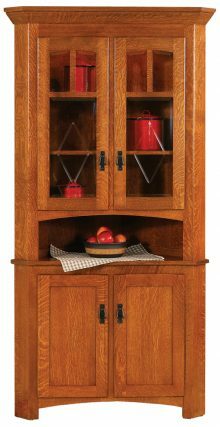 Leave the disposable furniture for someone else: Opt for a genuine Amish American-made corner hutch instead. 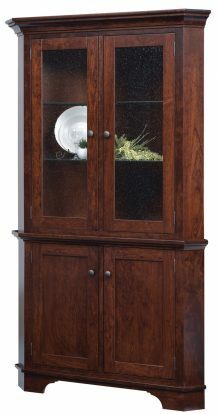 If you order today, we can give you up to 33% off the regular retail price of your corner hutch. You can also benefit from our large-order discount and save up to 13% by purchasing multiple items. Other ways to save include watching for our ongoing monthly promotions or choosing to pay for your order by check.